A parish workhouse operated at Claughton dating from 1795. Its location and layout are shown on the 1847 map below. 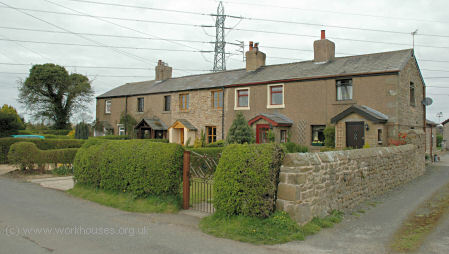 The workhouse site at Claughton is now occupied by cottages of unknown date, although those at the east are understood to have been rebuilt following a fire in the late 1800s. County of Lancaster: Barnacre with Bonds, Bilsborrow, Bleasdale, Cabus, Catterall, Claughton, Cleveley, Forton, Garstang, Great Eccleston, Hambleton, Holleth, Kirkland, Myerscough, Nateby, Nether Wyresdale, Out Rawcliffe, Pilling, Preesall with Hackinsall, Sowerby with Inskip, Stalmine with Staynall, Upper Rawcliffe with Tarnacre, Winmarleigh. The population falling within the Union at the 1831 census had been 11,918 with parishes ranging in size from Holleth (population 50) to Pilling (1,127) and Garstang itself (929). 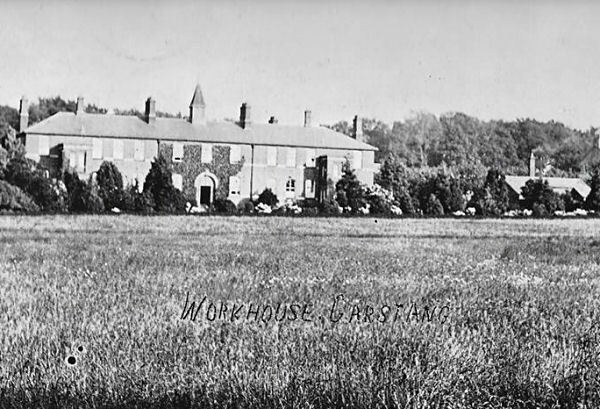 The first Garstang Union workhouse was the former parish workhouse building at Claughton. In 1876, construction of a new workhouse accommodating 67 paupers began at Bowgreave and received its inmates on 24th June, 1878. At the their meeting of 2nd September 1880, the Board of Guardians were informed that the cost of the new workhouse had been £6691-5s-4d. The initial loan was taken out for the scheme had been for £4000 but a further loan of £1750 was needed to complete the work. A further £941-5s-4d had then been spent on modifications. At the same meeting it was reported that the workhouse contained 11 old and infirm men, 6 women, 3 boys, 2 girls and 2 infants, making a total of 24 individuals. The new building comprised an entrance lodge, casuals' ward and a T-shaped block. Its location and layout are shown on the 1910 map below. Garstang Bowgreave workhouse site, 1910. Garstang Bowgreave workhouse from the north-west. The Bowgreave workhouse buildings no longer exist. 1847 — Master: John Ray; Matron: Elizabeth Curtis. Lancashire Record Office, Bow Lane, Preston, Lancashire, PR1 2RE. Holdings include: Guardians' minutes (1837-1930); Ledgers (1902-30); Workhouse management committee minutes (1908-14); etc.